WASHINGTON: Local prominent businessman Lutfi Hassan was invited to a round table discussion with the President Barack H. Obama recently on Thursday, July 11. 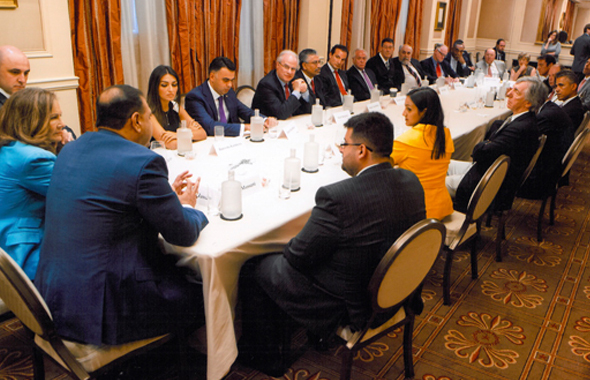 He was joined with 25 other business leaders from different industries for a debriefing by the President as well as discussion on a wide variety of issues. Obama briefed the group on his administration’s stand on the several domestic policy issues relating to healthcare, jobs and the economy. He also addressed foreign policy and foreign trade issues that relate to the Middle East and Africa. The President then opened up the meeting for an frank and candid discussion on various topics allowing each one of the participants to speak freely what was on their minds and responded eloquently to their questions while welcoming suggestions. Lutfi Hassan makes a point during the roundtable discussion with President Obama. Hassan complimented the President on his recent Africa tour and the announcement thereafter on the various initiatives including the Power Africa with the allocation of $7 billion. He suggested a more aggressive involvement of the Commerce Department in promoting Small & Medium Enterprise (SME) firms particularly in the countries with emerging economies and robust growth. Citing his own international business experience as well as the involvement in coordinating foreign trade missions as the Chairman of former Houston Mayor Brown’s Advisory Board for International Business Development, Hassan offered to offer his own first hand experience in helping to tweak the policy for the Trade Missions. The President graciously accepted his offer and Hassan has since connected him with the policy makers at the Commerce Department and the Overseas Private Investment Corp (OPIC).